Poland took on Northern Ireland who were playing in their first major tournament since 1986 and it turned out to be another cracking game where both teams canceled each other out in most part. It took 6 minutes after the break for Poland to finally break the deadlock when Arkadiusz Milik scored to make it 1-0 for Poland and put Ireland under massive pressure to come out from their comfort zone. Watch full match highlights of the game right here on this page. Arkadiusz Milik low left footed strike found its way into the back of the net at the start of second half as Poland finally broke the deadlock in what was a very competitive and closely fought game. 51′ 1 – 0 Arkadiusz Milik scored in 51st minute to give Poland the deserved lead. Michael O’Neill has guided his Northern Ireland side to their best ever FIFA ranking on the course of incredible qualifying campaign which was spearheaded by Kyle Lafferty’s 17 goals in the qualifying. Poland on the other hand qualified via a difficult group with Lewandowski scoring goals left and right. Ireland are also 12 games unbeaten heading into the big competition. Team News & Lineups: Poland has some injury worries heading into the opening game with Kamil Grosicki joining already out wingers (Rybus and Wszolek) after suffering ankle injury. Apart from that they are in good shape with Lewandowski playing upfront on his own with packed midfield. Kyle Lafferty gave a scare for Irish supporters after his groin problems persisted but he is able to recover and should start on Sunday. This is how I expect both teams to lineup on Sunday. 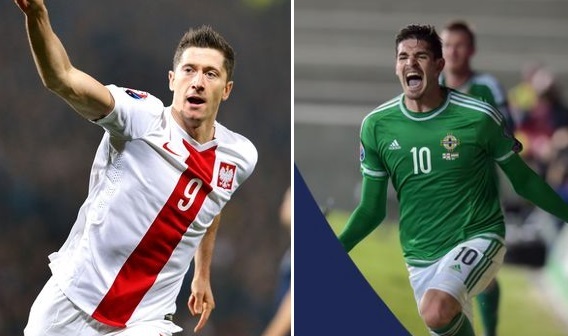 Match Predictions: All games so far has been competitive in the competition and I expect another thrilling encounter on Sunday between 25th Fifa ranked Ireland and 27th placed Poland. On paper Poland has a quality squad with world class goal scorer in Lewandowski and he might prove to be the different between the two teams. I am going with a narrow 2-1 win for Poland here.